Tyler Collins, SEO & Digital Marketer at Bulletproof Digital, provides a highly sophisticated, yet easy to follow “surgical approach” to search engine reputation control. 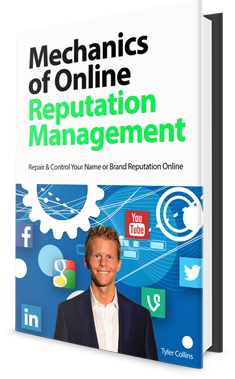 He has built his career on understanding and executing on the mathematical formulas that govern the way search engines display information, and provides you a step-by-step, tactical mission blueprint to swiftly control and eliminate negative content online (See Tyler Collins on Amazon). Highly sought after by Fortune 500 companies, C-level executives, and online marketing “gurus” seeking the most cutting-edge tactics for search engine placement and online reputation management, Collins has spent the last 15 years in Internet marketing & search engine optimization, has built dozens of successful digital media teams (see Bulletproof Digital), and delivers results for over 3,000 clients in over 130 different industries. Repair search results for any name or brand with this surgical approach to eliminating bad press, suppressing unwanted sites or listings, and infiltrating the search vertical with positive content and new media types for a better reputation. Full-spectrum digital marketing capabilities give us great advantages in repairing and controlling search reputations. From patent research, to relentless testing, proprietary technology, and thousands of successful campaigns, we have every tool necessary to complete the job. Contact us today or learn more.